Let’s get MEGA to the BURRITO! These are my affectionately nicknamed “Mega-Burritos,” and honestly, this is all there is for me in the world right now. We are down to the wire before this baby makes her arrival, that this – or variations of this – is literally all I’ve been eating. Does this mean she will love spicy cauliflower and walnut taco meat and roasty sweet potatoes and vegan queso and avocados and flour tortillas and salsa? A mother can only hope. I am supposed to be saving that stash of cauliflower walnut taco meat in my freezer for, like, later this fall? But, like, HOW? It is burning a hole in my freezer. I need it at every meal. It’s so easy to just grab a cup here and there and pop it in the skillet and then five minutes later, be feeding your face vegan nachos, tacos, quesadillas, and mega-burritos (LITERALLY HAVE MADE ALL OF THESE). Today – let’s focus on the Mega-Burrito, but just keep in mind that this concept works across all our favorite Tex-Mex food groups. I’m going to let you in on a secret, which is that sometimes I just throw whatever random veggies I have in a skillet with that frozen cauliflower walnut taco meat (carrots? peppers? spinach?). Also, sometimes a few eggs. It just depends on what I have or what I’m feeling in the moment. And my second secret is that even though we’re packing all of this into an already-carb-solid flour tortilla, I do not get mad if there is a little extra carb-action in the form of white or brown rice in there, too. Look at this and tell me you do not want to eat it. And then drizzle extra vegan queso over the whole thing because you obvioulsy aren’t messing around here. This is a MEGA BURRITO, for crying out loud. I raise my Mega-Burrito to you, friends! Remember: this combo is also great reformatted as nachos, tacos, and quesadillas. Just you keep that in mind. 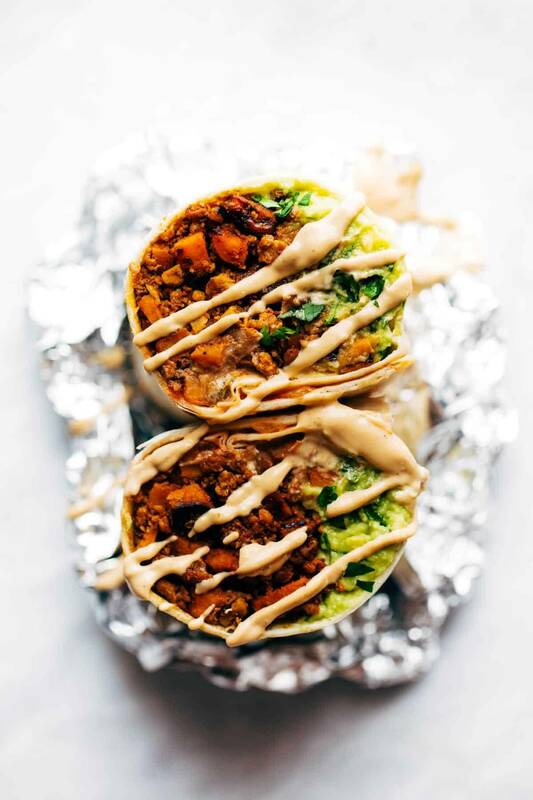 These Vegan Mega-Burritos are stuffed with a sweet potato, cauliflower, and walnut taco meat filling, plus the usual suspects of avocado, salsa, and a heavy thwap of vegan cashew queso! Versatile, quick to make, and seriously SO GOOD. Filling: Start with your sweet potatoes in a skillet with a swish of oil and salt. Saute until fork-tender. Add prepared cauliflower walnut taco meat and just enough water to get it looking nice and saucy and taco-meaty. Assemble: Stuff a flour tortilla with mashed avocado, cauliflower walnut filling, salsa, cilantro, and queso or cheese. Roll, wrap, fry in a skillet… whatever suits your fancy. The Mega-Burrito says YOU DO YOU! If you use a sweet potato, chop it up small so the pieces cook faster! You don’t have to use sweet potatoes. Try carrots, spinach, bell peppers, mushrooms, zucchini, you name it! The cauliflower walnut meat would be good as a filling in and of itself, so if you’re really in a rush, you don’t have to add the sweet potatoes or any other veggies for that matter. I just like to add veggies to bulk it up and add some extra nutrition. 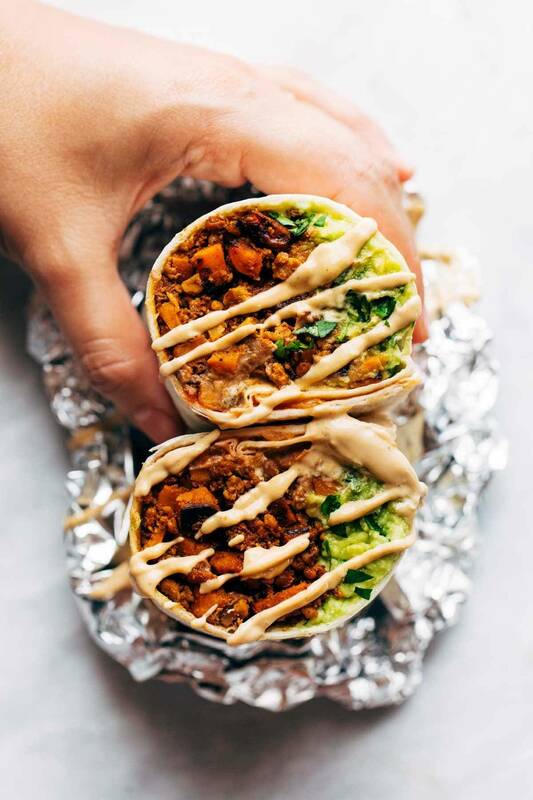 The post Vegan Mega-Burritos appeared first on Pinch of Yum.